Ms. Martha Del Bosque currently serves as a Programs Coordinator and works directly with families in need of Miracles for Kids’ services. Her role includes enrolling families in the Miracles for Kids Grant Program, assisting families at Miracle Manor, and maintaining family records. Ms. Del Bosque also speaks Spanish fluently and assists in translation and communication with Spanish speaking clients. 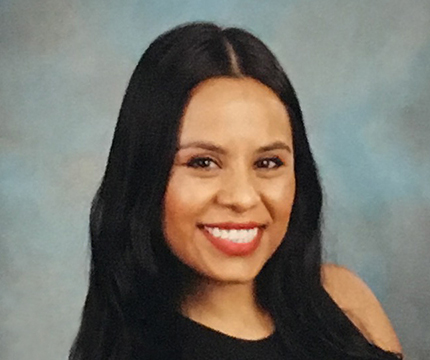 Prior to her current role as Programs Coordinator, Ms. Del Bosque served as an intern for Miracles for Kids while completing her Bachelor of Arts Degree in Psychology at California State University, Fullerton. During her internship, she worked heavily in the Programs Department where she discovered her passion for helping families. “I feel like there’s nothing more rewarding than being that person who can make a difference in someone else’s life and I believe that’s what Miracles for Kids does every day,” said Ms. Del Bosque. In additional to her passion for helping families in need, Ms. Del Bosque has enjoyed dancing since she was a young child. She is currently part of a semi-professional salsa dance team that travels for performances and dance festivals.